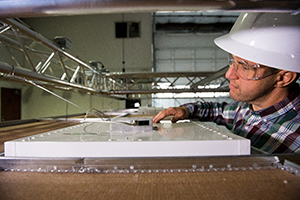 Researcher Michael Poplawski examines a connected lighting system at PNNL's Connected Lighting Test Bed in Portland, Oregon. Remember how much you appreciated your home's first motion-sensing outdoor lighting system? Flash forward to today’s motion-sensing connected lighting systems that deliver energy savings over conventional lighting solutions by reporting their own energy consumption and facilitating data-driven energy management. These energy-saving systems control lighting to increase or decrease lighting levels in response to building occupant presence and need. They represent the convergence of intelligent controllable light sources, communication networks, sensors, and data exchange. A recently published report—authored by PNNL lighting research engineers Jason Tuenge and Michael Poplawski on behalf of the U.S. Department of Energy’s Solid-State Lighting Advanced Research & Development Program—represents the first part of a DOE study to explore the energy reporting capability of commercially marketed PoE connected lighting systems, which may become a data-collection platform that enables greater energy savings in buildings and cities. The new report provides a brief background on the development of the various PoE technologies—ranging from standards-based to proprietary—and illustrates the convergence of PoE power-sourcing capabilities and LED luminaire power requirements. It then classifies PoE system devices in relationship to how they are used in systems, introduces clarifying terminology, and briefly describes different PoE system architectures implemented by various lighting manufacturers. A discussion of existing standards and specifications that address energy reporting is provided, and existing test setups and methods germane to characterizing PoE system energy reporting performance are reviewed. Some minimum level of detail describing where, when, and how energy is reported by commercially available PoE lighting systems should be developed and adopted by manufacturers and technology providers. Recommended practices should be developed to limit energy loss in PoE cables, especially for installations where they are not explicitly reported. PoE stakeholders experienced in the characterization of energy reporting performance should contribute to any test setups and methods included in standards and specifications being developed by appropriate organizations. Lighting industry stakeholders should encourage standard and specification development organizations to coordinate existing and new activities, consolidate competing activities, and minimize overlap. For more information, download Power over Ethernet (PoE) Lighting Systems Energy Reporting Study, Part 1, or visit DOE’s Connected Lighting Systems website.